Reflections of a Newsosaur: Help wanted. Desperately. Newspapers have lost more than half of their print recruitment revenues since the category hit an all-time high of $8.7 billion in 2000, the peak of the Internet bubble. Though final numbers aren’t in for 2007, print recruitment revenues will be lucky to hit $4 billion for the year, making for a sales drop of about 54% in the seven-year period. This is a big deal, when you consider that recruitment revenues accounted for nearly 18% of all newspaper sales in 2000. In 2007, they will generate approximately 11% of the industry’s depressed sales. This is an even bigger deal when you consider that the $4.7 billion in vaporized sales is equal to the combined revenues over the last 12 months of the McClatchy, Lee, Media General and Journal Register publishing companies. It’s as though those companies had been wiped off the face of the earth. The sad state of the recruitment advertising business provides an instructive look at how the tradition-bound newspaper industry copes (or doesn’t) with change. To explore the subject more fully than space permits here, I have prepared a new white paper that reviews not only what went wrong, but also, significantly, how newspapers can begin to get ahead of the continuing evolution in this key market segment. Get the free white paper by emailing me at alan [dot] mutter [at] broadbandxxi [dot] com. You already know where recruiters and their ad dollars have gone since 2000: the Internet. By the conservative estimate of Peter Zollman, the founder of the Classified Intelligence consulting group, some $3.5 billion in recruitment ads were sold in 2007 by such online entities as Monster, Hot Jobs, Dice, Ladders, 6FigureJobs, Craig’s List (which charges a nominal price for help-wanted ads in the largest metro markets) and scores of small sites like Gas Work, which specializes in positions for anesthesiologists. Gordon Borrell, who heads a research firm bearing his name, believes the total online expenditure for recruitment last year was a much larger $6.7 billion. His estimate includes not only money spent on sites ranging from Monster to Gas Work but also the funds that companies spend on the recruitment environments they build on their own websites. Either way, newspapers at best are getting half of a highly profitable business that used to be all theirs. How could this have happened? The simple answer is that newspapers – blinded by their utter dominance of the recruitment advertising market for as long as anyone can remember – were oblivious to the major shift that took place in the last decade in how employers recruit workers and how individuals look for jobs. Thanks to the power of the Internet to precisely match employers and job seekers through a vast array of targeted websites, there no longer is a need for job seekers to squint at the teeny type in the newspaper to find a job. With newspapers carrying far fewer listings than ever, there’s not much to squint at, either. 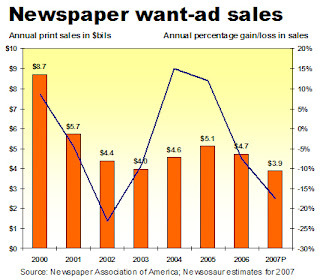 As you can see from the graph below, the beginning of the end of newspaper supremacy in want-ad advertising coincides with the twin traumas of the tech collapse in late 2000 and the 9/11 attacks in 2001. When want-ad bookings evaporated between 2001 and 2003, most newspaper executives viewed the problem, though unwelcome, as a cyclical setback that would resolve itself as the economy regained its strength. Although bookings seemed to follow a classic recovery trajectory in 2004 and 2005, ad sales began eroding despite a solid economy in 2006 and then utterly collapsed in 2007. With the economy in the midst of an apparent slowdown in 2008, recruitment advertising, like almost all other categories, appears to be headed this year for a new modern-day low. In hindsight, it is easy to see that the problem with the recruitment market wasn’t caused as much by economic fibrillations as it was by a fundamental, or secular, shift in the marketplace. Though the shift proved to be earth shaking, most publishers never felt the vibrations until it was too late. Worse, the overwhelming amount of the industry’s thought and energy to this very moment has gone into desperately and, as it turns out, fruitlessly trying to preserve a business spurned by a growing number of readers and advertisers alike. Notably, it was only last month that the Chicago Tribune became the first major newspaper to concede the seemingly inevitable demise of print reecruitment advertising by limiting help-wanted listings to two days a week. The Tribune is using its remaining print ads to essentially refer readers to its online partner, CareerBuilder.Com. The irony of the Tribune's new strategy is that CareerBuilder itself has a questionable future, given that it is nothing more than an online emulation of the anachronistic and increasingly broken print model. Career Builder, which is owned by the Tribune Co., Gannett and McClatchy, is built on the premise that job seekers will flock to a single source – sort of like the Sunday newspaper of yore – where they conveniently can find all the jobs in town. The corollary premise, of course, is that someone who wants to hire a truck driver will pay handsomely for the privilege of reaching a crowd of workers ranging from nannies to machinists to insurance salesmen. But that’s not how people look for jobs – or employers fill them. Kids today can apply online for jobs at Wal-Mart.Com, anesthesiologists can list their resumes on GasWork.Com, and software engineers can go directly to Dice.Com, an all-tech job board, or the Hewlett-Packard website, which lists every position in the company in the world. If those choices are too much work, you can put a widget on your computer’s desktop, tell it the sort of job you would like – and wait for it to let you know when SimplyHired.Com, turns up a suitable position as it crawls and indexes jobs from every nook and cranny on the web. A competing classified-aggregator, Oodle.Com, scrapes listings not only from job boards and corporate websites, but also from the sites of newspapers and their partners, Career Builder, Hot Jobs and Monster. Is that still too much work to do to look for work? NotchUp.Com says it has more than 1,000 companies (from Google on down) interested in paying you hundreds of dollars to sit for an interview with a recruiter. In the slickest viral marketing launch since YouTube, NotchUp lets you seamlessly and speedily add your LinkedIn listing to its database and then invite all your contacts to do likewise. After I registered, I watched with amazement as several of my well-employed LinkedIn contacts joined NotchUp within minutes. While it remains to be seen whether NotchUp – or something smarter, faster, cheaper or better – will catch on, it is clear that the recruitment market is evolving farther and faster than ever from the traditional, one-size-fits-all model pursued by newspapers and their fellow Media 1.0 partners, Career Builder, HotJobs and Monster. As this market hurtles irretreivably down the path of dynamic change, the big question for newspapers is not whether they should try something different but whether they can react quickly and wisely enough to save the half of the business they haven’t lost. Alan--A nice article but as one of the newspaper industry's prime "bashers" I am not sure the point of it. And especially from a self-proclaimed journalist. Oh, that was 20 years ago. Let's here what you would do to fix the newspaper industry? Alan - It seems you have been misinformed on Careerbuilder's business model. It is nothing similar to what you described. I also think it is ironic that 94% of the Fortune 500 companies utilize Careerbuilder on a large basis. Careerbuilder has also tapped into the Human Capital Consulting industry, this will continue to increase our lead in the market.